August 26 - As decision day for which sport will be included on the Olympic sports programme from 2020 looms just under two weeks away, the leaders of the World Baseball Softball Confederation (WBSC) have identified the key ingredients that they feel the bat-and-ball sports would bring to the Games. 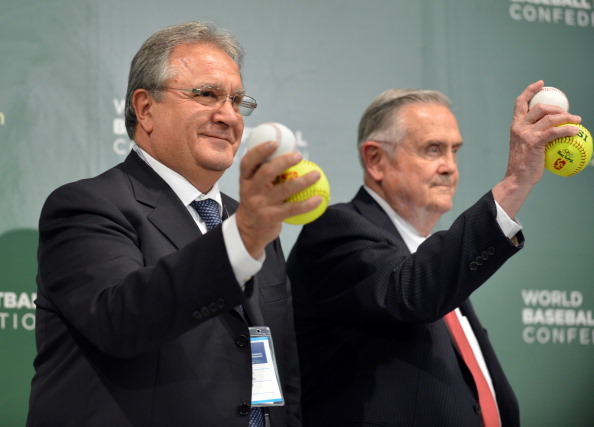 The WBSC's Play Ball 2020 campaign marks the third time in the past eight years that the sports have attempted to regain their position on the Olympic programme after being controversially ousted in 2005, and co-Presidents Don Porter and Riccardo Fraccari believe that this experience has proven invaluable, and with the two sports now working in unison to achieve the same goal, they feel their bid is the strongest yet. priorities with the Olympic Movement," said Fraccari and Porter. "We have listened and learned from the IOC (International Olympic Committee) about the importance of athlete experience, as well as fans experience, and the need to provide an electrifying sporting atmosphere in the venues that engages young people, the host nation and city, as well as broadcast and new media audiences worldwide. "We reviewed our sports and improved key aspects of how baseball and softball can be presented as sports at the 2020 Olympic Games." A case study report conducted by Porter and Fraccari, 'Why Baseball and Softball will Strengthen the Olympic Movement', identifies the fast-and-furious six-day Olympic tournament format and its ability to reduce the burden of costs and logistical issues as a major positive for the bid, as well as the massive base of 65 million players and over 150 million fans in 140 territories which they believe would ensure capacity crowds for matches, as well as huge appeal for advertisers and television audiences. There is also emphasis on the rapid global development of the sport, the chance to establish women's softball and men's baseball as equal partners in an Olympic sport for the first time, and the impressive attendances and participation in youth events, such as the Little League World Series which saw 90,000 youngsters from 90 nations compete with around 400,000 fans packing the stands for the final stages. "We are growing our sport together for our athletes, toward 2020 and for the Olympic Movement," the co-Presidents conclude. "We believe that the Olympic Games is the pinnacle for every athlete and every sport, and if included, we will make our resources available to the Olympic Family."